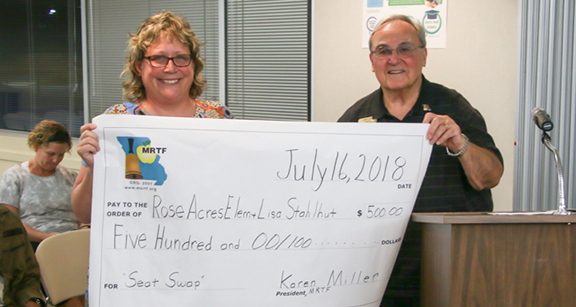 The Missouri Retired Teachers Association (MRTA) recently presented grants totaling $2,000 to four educators to use for programs benefiting Pattonville students. Kendra Worsham, counselor at Parkwood Elementary School, who is using grant funds to provide books and materials for a program for intermediate girls that teaches important social skills and how to maintain healthy relationships with friends. Jenni Gruendler accepting her grant. Heather Koepke accepting her grant. Lisa Stahlhut accepting her grant. Kendra Worsham accepting her grant.